Thomas Markram, Deputy to the UN High Representative for Disarmament Affairs addresses the Security Council. A senior United Nations official on Wednesday stressed the need for an independent investigation to determine who used chemical weapons in Syria, and called on the Security Council to show unity to not let the perpetrators get away with it. “The persistent allegations of the use of chemical weapons in Syria underscore the need to identify solutions and reach agreement on an appropriate accountability mechanism,” Thomas Markram, Director and Deputy to the High Representative for Disarmament Affairs, told the 15-member body, which last year failed to renew an international panel investigating use of chemical weapons in that country. The Joint Investigative Mechanism (JIM) of the Organisation for the Prohibition of Chemical Weapons (OPCW) and UN was created in 2015 by the Council, but its mandate expired in November 2017. “While allegations of the use of chemical weapons have not stopped, consideration of a mechanism for accountability has apparently slowed, if not come to a standstill,” said Mr. Markram, who addressed the Council on behalf of High Representative Izumi Nakamitsu. Today, which marked one year since the tragic use of chemical weapons – the deadly nerve agent sarin – in Khan Shaykhun, is a fitting date to remember the victims of this attack, he added. On the issue of chemical weapons production sites declared by Syria, Mr. Markram said that destruction of the two remaining facilities will be verified by the OPCW and is expected to be completed within two to three months from the start of destruction. As for the allegations of the use of chemical weapons that were brought to the attention by the Syrian Government, the OPCW fact-finding mission is currently in Damascus to determine if such weapons were used. The mission, however, is not mandated to determine who used them. Her Russian counterpart Vassily Nebenzia said that while some Western countries are chasing “the phantom chemical weapons” of Damascus, the dangerous potential of chemical terrorism continues to accumulate in the region. He added that Western countries insist on recreating a JIM which would rubber-stamp the decisions that they need and that his delegation has proposed an alternative to the former JIM and circulated a draft resolution. 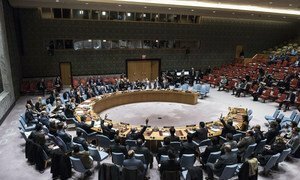 For the third time in two days, the United Nations Security Council on Friday failed to adopt a resolution on the mandate of an international panel investigating use of chemical weapons in Syria due to a negative vote by permanent member, Russia.